Just what makes planned trips frustrating is that most of the time, they don't materialize mostly due to dependencies involving other people. Tutubi has a high "completion rate" for trips he took on his own, not so when other people are in it. The recent planned trip to Piit Resort in Pangil town (now renamed http://www.backpackingphilippines.com/2011/08/panguil-river-eco-park-piit-resort.html) and/or Turumba Swimming Pool (now Turumba Springs Resort or the Panghulo (formerly known as Nuestra Señora delos Dolores de Turumba Swimming Pool), both visited by the child Tutubi, did not push through due to rains and some commitments in Tutubi's "entourage" but he opted to push through with another place he wanted to re-visit: The Twin Falls of Kalayaan, Laguna. 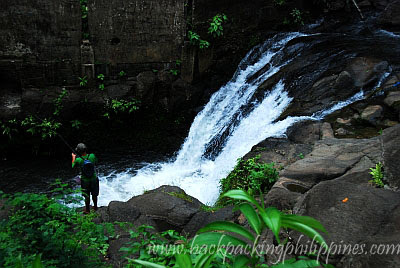 The town of Kalayaan, Laguna, Paete's next-door neighbor has not just one, but two, waterfalls (e.g. 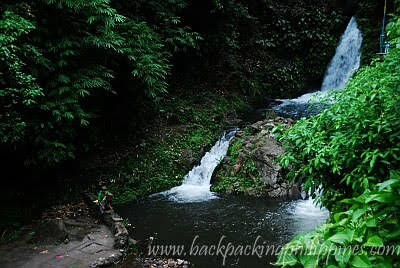 Paete has it's own waterfall, Pakil has one, Pangil at least two, Siniloan has 6, Sta. Maria has about 3 waterfalls, Pagsanjan/Cavinti have the world-famous Pagsanjan Falls (magdapio falls), Los banos Baños has Dampalit Falls et al) that Tutubi visited when he was still a child together with his brothers. A last minute decision to visit any of the three mentioned resorts near Paete was reached when Tutubi's father confirmed the presence of parking area near the twin waterfalls, and so the 10 minute drive from Paete to Kalayan pushed through. On arrival at the resort around 4:30pm, Tutubi was informed that the resort will close at 5pm and that cleaning of the pool was taking place, but the gatekeeper let them enter the resort premises for free, something that is really good for Tutubi for he didn't intend to swim due to the already cold weather (the water there is already cold even during summer). Tutubi only wanted to check out the place to take pictures for additional "bloggable" place, he took a few pictures, again showing his lazy way not to bring a tripod (and an ND filter), and went to chat with his first cousin hanging out at the resort, someone he hasn't seen for quite a while. the lower waterfall of Kalayaan Twin Falls (partly hidden by lush vegetation) whose basin/lagoon now developed into a swimming pool. The other twin falls can be reached through concrete steps/stairs on the mountain sides (the Sierra Madre mountain range). Tutubi didn't bother trekking up due to limited time as rains may spoil the hike. 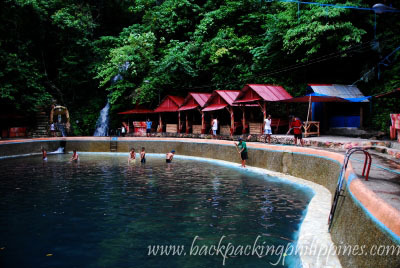 Kalayaan Twin falls, to Tutubi's expectation, is now a barangay operated resort with the huge basin now turned into a swimming pool with marble bottom. He remembers the lagoon before surrounded with huge rocks where you can hop on top but quite slippery. After a few pictures and chit-chat with resort gatekeeper and his cousin, Tutubi left off without a visit the real twin of the waterfalls that can be reached via concrete steps. Having so many travel posts with dates not far from the last one, I wonder what you actually do for a living. I envy you my friend. I would like to ask magkano po ung fare pag nagcommute lng? Tsaka ung overnight rate? klangan tlga minimum of 20 persons? Eh panu po kung dalawa lang kayo na pumunta then decided na mag-overnight? Same rate pa kaya? Wow!! ganda naman dito. hmm.. ask ko lang, pwede ba dito magpa-reserve for 2days and 1night? mga magkano kaya.. thanks. I've been checking out your site for effortless trip. Mura+Maganda+Malapit=ayus para sa mga walang magawa!